The interface between knowledge and decision-making is broken. Societal discussion surrounding this interface over the past few years reveals several disappointments and a frustrated atmosphere. The results from a survey Sitra conducted in the summer of 2017 reinforce this notion. Problems have been identified both in knowledge production and decision-making. Resolving complex societal problems requires a more comprehensive perspective with a more dialogical approach and a broader perspective on what is considered as knowledge and expertise. Despite acknowledging the problems in the interface between knowledge and decision-making, no determined effort for improvement has been made. Why? Where are the greatest obstacles? What type of new thinking does achieving change require? 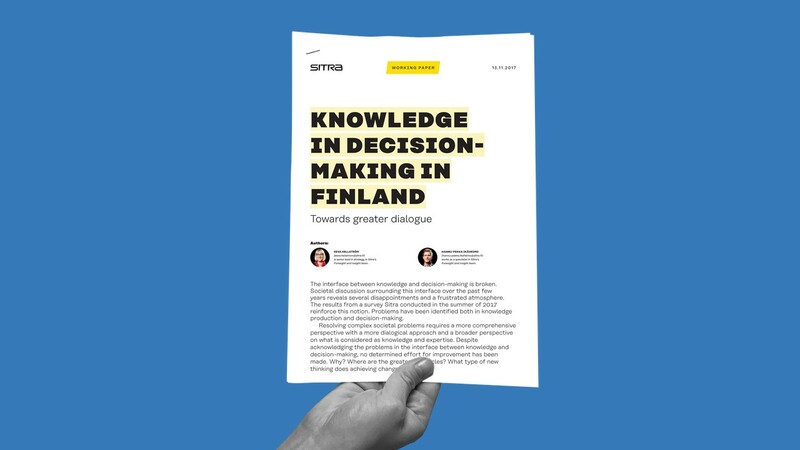 In the summer of 2017, we sent a knowledge in decision-making survey to those in Finland who work in the interface of knowledge and decision-making and are interested in the topic. This report presents the most important findings of the survey. In addition, we link them to a broader topical discussion and present our own interpretations. The content of the survey is saved in the Finnish Social Science Data Archive (www.fsd.uta.fi) for anyone to use. More detailed results and figures can be found on the Sitra website and on SlideShare. The data and results are published in Finnish. How can foresight flavour a hotpot? What do we develop when we develop leadership? Haste and the one-sided use of knowledge are challenging decision-making. This calls for greater dialogue. We need multidisciplinary knowledge in societal decision-making. Knowledge in decision-making topic aims to identify challenges and possibilities in the changing relationship between knowledge and decision-making, try new interactive models of knowledge and decision-making, and help to develop the already existing arenas of knowledge and decision-making.